Certified ICC Coaching Trainer. Certified Business Coach International Coaching Community and Analytic-Networking. Accredited Supervisor and Coach in the Polish Coaching Chamber. Organizational Development Consultant FCODC. Trainer, mentor, and business advisor. Doctor of Humanities. Experienced manager – she has been working in managment positions for over 20 years in such areas as chemistry, finance and consulting. Permanent lecturer at Leon Kozminski Academy MBA studies, member of the LKA Coaching Centre team. Coaching lecturer at SWPS University of Social Sciences and Humanities. 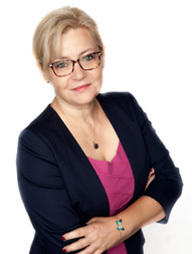 She is the author of many publications on coaching, including two books published under the titles “Life coaching” and “Systemic thinking in coaching”. She has been learning and still learns from the best of the world: Dilts, Gilligan, Popielski, Boldstad, Sissons, O’Connor. Since 2016 she has run, together with Piotr Pilipczuk, the Holistic International Coaching Community School in Poland and their company Values Team, spreading the idea of building values-based organizations. She is the Program Director in Values Team, responsible for substantive preparation of realized projects.